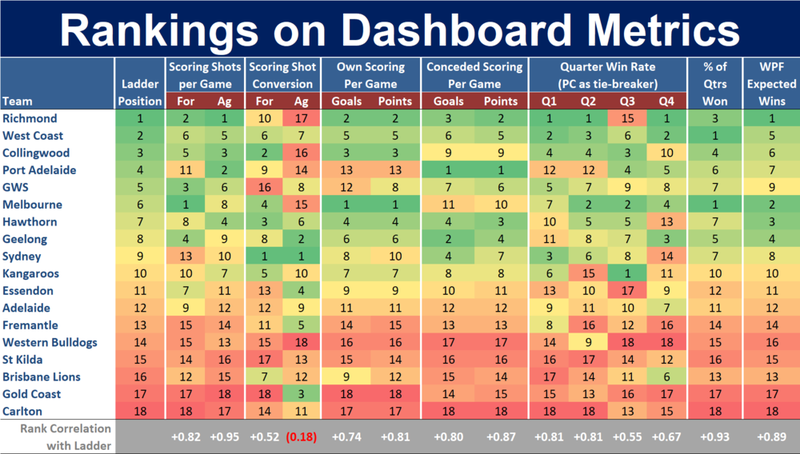 Not much change in the rankings on Dashboard Metrics this week, although Port Adelaide's climb into 4th on the competition ladder is interesting given their lowly rankings on Scoring Shot Production, Own and Opponent Scoring Shot Conversion, and on 1st and 2nd Quarter performances. For them, it's largely been about defence and second-halves this season. All that said, based on their overall Scoring metrics and the Win Production Function, they are three spots higher-ranked than we might expect. The same is true for Collingwood, who are ranked 6th by the Win Production Function, though their lofty competition ladder ranking is due more to their offence than their defence. They're 5th on Scoring Shot Production and 2nd on Own Conversion, and while they're also 3rd on Opponent Scoring Shot Production they're 3rd-last on Opponent Conversion. As a result, they've conceded more goals than eight other teams, including six that sit below them on the competition ladder.